Call us at 208.785.7494 or fill out the form below. Klingler Asphalt Maintenance is your preferred locally owned pavement maintenance professionals. Klingler Asphalt Maintenance prides itself in having built the company on a high standard and quality of work at a reasonable and fair price using only the highest quality products available. The majority of our customer base comes from long term repeat customers. We provide service to Idaho, Northern Utah, Western Wyoming and Southern Montana. We have modern state of the art equipment as well as an outstanding and highly trained crew to serve you. We look forward to earning your business and the opportunity to work with you! If an asphalt surface is not properly maintained and water infiltration occurs through cracks, most likely it will result in cracking and eventually pot holes. The most effective repair at this point is to remove and replace the damaged asphalt. A quality paving project starts with a good base, correct drainage, and adequate compaction. As asphalt is a large investment, it is imperative that you do your homework and hire only a local, qualified and reputable company. Cracks are caused primarily by sun oxidation, which causes asphalt to shrink leading to cracks. Freeze and thaw cycles, as well as moisture and traffic, can also result in asphalt cracking. Keeping cracks sealed will save thousands of dollars. The pavement is the first and last thing customers see as they are entering and leaving a property. This is why it is so important to be on a routine preventative maintenance program to help to maintain the value of your property. Parking lot striping enhances the appearance of a property, as well as increasing safety and decreasing parking chaos. Parking lot striping should be considered on all parking lots, and is usually required by law. Parking lot sweeping is a very important part of pavement maintenance, and should be done on a regular basis. Routine sweeping helps to keep lots clean and presentable, providing a neat and desirable image for any business. 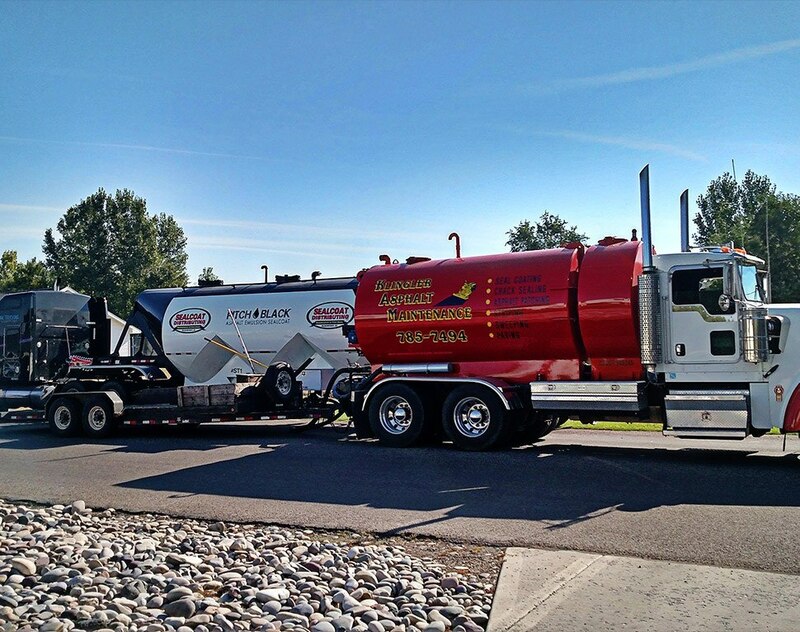 Klingler Asphalt Maintenance provides snow removal and deicing services in the Blackfoot, Idaho area. We can handle all your needs, large or small including removal of snow piles. Klingler Asphalt Maintenance only uses the best sealcoating materials for your driveway, parking lots, roadways and streets. We use Pitch Black® asphalt pavement sealer, a premium, proprietary polymer reinforced, high-grade, custom rubberized pre-mixed asphalt emulsion sealcoat blended with carefully selected minerals, fillers, and fibers, formulated specifically to produce a superior asphalt maintenance product. Each component was selected for its unique characteristics, which when combined creates a highly adhesive, extremely flexible seal coat with the deepest and longest lasting black color, firmest body, and greatest durability. Copyright © 2019 Klingler Asphalt Maintenance. www.KlinglerAsphalt.com Asphalt & Paving Professionals.